MPA debate finished its season on December 1 at the State Tournament at South Saint Paul High School. Overall, the team placed third in the tournament ahead of Minnetonka and Stillwater and behind Rochester Mayo and Eastview High Schools! In the novice division, the team of juniors Katie Goodno and Ben Lash narrowly missed advancing with an excellent 4-1 record. 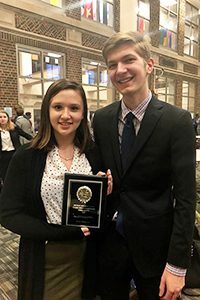 In junior varsity, the team of junior Quincy Lewis and sophomore Luke Zscheile advanced to quarterfinals, the team of sophomore Hana Miller and junior Charles Grimes advanced to semifinals, and the team of sophomores Ellen Vergin and Isak Dai were the champions in a division of 49 teams. Congratulations, Panthers!